Securitization is a structured finance process that distributes risk by aggregating debt instruments in a pool, then issues new securities backed by the pool. The term “Securitisation” is derived from the fact that the form of financial instruments used to obtain funds from the investors are securities. As a portfolio risk backed by amortizing cash flows – and unlike general corporate debt – the credit quality of securitized debt is non-stationary due to changes in volatility that are time- and structure-dependent. If the transaction is properly structured and the pool performs as expected, the credit risk of all tranches of structured debt improves; if improperly structured, the affected tranches will experience dramatic credit deterioration and loss. All assets can be securitized so long as they are associated with cash flow. Hence, the securities which are the outcome of Securitisation processes are termed asset-backed securities (ABS). From this perspective, Securitisation could also be defined as a financial process leading to an issue of an ABS. Securitisation often utilizes a special purpose vehicle (SPV), alternatively known as a special purpose entity (SPE) or special purpose company (SPC), reducing the risk of bankruptcy and thereby obtaining lower interest rates from potential lenders. A credit derivative is also sometimes used to change the credit quality of the underlying portfolio so that it will be acceptable to the final investors. Securitisation has evolved from its tentative beginnings in the late 1970s to a vital funding source with an estimated outstanding of $10.24 trillion in the United States and $2.25 trillion in Europe as of the 2nd quarter of 2008. In 2007, ABS issuance amounted to $3,455 billion in the US and $652 billion in Europe. First, mortgage loans are purchased from banks, mortgage companies, and other originators. Then, these loans are assembled into pools. This is done by government agencies, government-sponsored enterprises, and private entities, which may guarantee (securitize) them against risk of default associated with these mortgages. Mortgage-backed securities represent claims on the principal and payments on the loans in the pool, through a process known as Securitization. These securities are usually sold as bonds, but financial innovation has created a variety of securities that derive their ultimate value from mortgage pools. Most MBS’s are issued by the Government National Mortgage Association (Ginnie Mae), a U.S. government agency, or the Federal National Mortgage Association (Fannie Mae) and the Federal Home Loan Mortgage Corporation (Freddie Mac), U.S. government-sponsored enterprises. Ginnie Mae, backed by the full faith and credit of the U.S. government, guarantees that investors receive timely payments. Fannie Mae and Freddie Mac also provide certain guarantees and, while not backed by the full faith and credit of the U.S. government, have special authority to borrow from the U.S. Treasury. 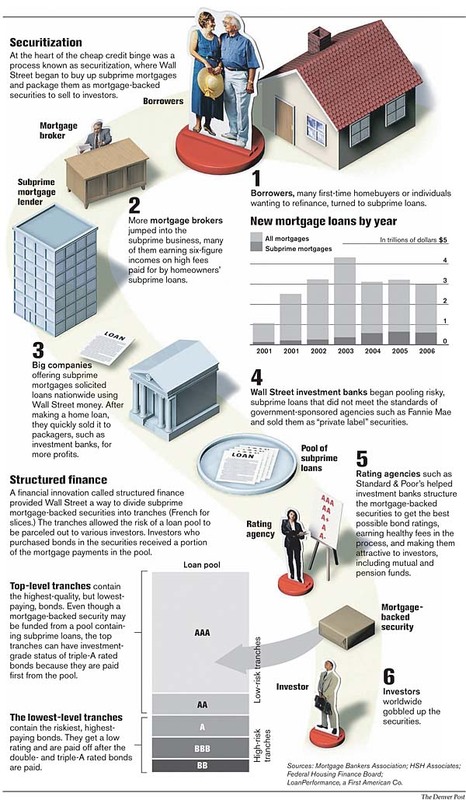 Some private institutions, such as brokerage firms, banks, and homebuilders, also securitize mortgages, known as “private-label” mortgage securities. Residential mortgages in the United States have the option to pay more than the required monthly payment (curtailment) or to pay off the loan in its entirety (prepayment). Because curtailment and prepayment affect the remaining loan principal, the monthly cash flow of an MBS is not known in advance, and therefore presents an additional risk to MBS investors. Commercial mortgage-backed securities (CMBS) are secured by commercial and multifamily properties (such as apartment buildings, retail or office properties, hotels, schools, industrial properties and other commercial sites). The properties of these loans vary, with longer-term loans (5 years or longer) often being at fixed interest rates and having restrictions on prepayment, while shorter-term loans (1–3 years) are usually at variable rates and freely pre-payable. Collateralized debt obligations (CDOs) are a type of structured asset-backed security (ABS) whose value and payments are derived from a portfolio of fixed-income underlying assets. CDOs securities are split into different risk classes, or tranches, whereby “senior” tranches are considered the safest securities. Interest and principal payments are made in order of seniority, so that junior tranches offer higher coupon payments (and interest rates) or lower prices to compensate for additional default risk. A few academics, analysts and investors such as Warren Buffett and the IMF‘s former chief economist Raghuram Rajan warned that CDOs, other ABSs and other derivatives spread risk and uncertainty about the value of the underlying assets more widely, rather than reduce risk through diversification. Following the onset of the 2007-2008 credit crunch, this view has gained substantial credibility. Credit rating agencies failed to adequately account for large risks (like a nationwide collapse of housing values) when rating CDOs and other ABSs. Many CDOs are valued on a mark to market basis and thus have experienced substantial write-downs on the balance sheet as their market value has collapsed. A credit default swap (CDS) is a swap contract in which the buyer of the CDS makes a series of payments to the seller and, in exchange, receives a payoff if a credit instrument (typically a bond or loan) goes into default (fails to pay). Less commonly, the credit event that triggers the payoff can be a company undergoing restructuring, bankruptcy, or even just having its credit rating downgraded. While often described as insurance, credit default swaps differ from insurance in many significant ways. The cost of insurance is based on actuarial analysis. CDSs are derivatives whose cost is determined by the Black-Scholes option pricing model. Insurance contracts require the disclosure of all risks involved. CDSs have no such requirement, and, as we have seen in the recent past, many of the risks are unknown or unknowable. Most significantly, unlike insurance companies, sellers of CDSs are not required to maintain any capital reserves to guarantee payment of claims. In that respect, a CDS is insurance that insures nothing.